When I first started this blog almost eight months ago, I had NO CLUE what I was doing (and I’m still learning)! It didn’t take me long to realize that no matter how good my recipes were, if they didn’t look good, it didn’t matter. 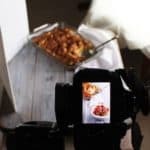 We live in a visual world… here’s what I’ve learned about food photography and styling so far. I started out with a dinosaur point-and-shoot camera, paying little attention to camera settings and food styling. 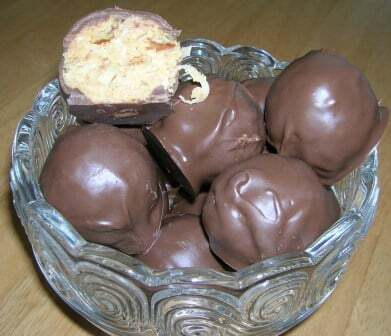 Here is my very first photo for my Chocolate Peanut Butter Balls. Ouch! Harsh lighting is the first thing I see! Not that I am a wizard behind the camera. I’m not here to tell you I am a photography expert, because I’m not. I’m still learning every day. If you’re a food blogger (or just like taking photos of food), I hope that I can pass along what I’ve learned so far on this blogging journey of mine that I love so much! 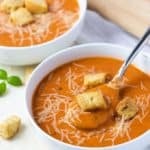 Back in March 2012, I came across this food styling and photography post on one of my favorite blogs. I immediately bought the book that RecipeGirl recommended and have fallen in love with it. Plate to Pixel is one of my favorite books and I am giving away a copy to one lucky reader! Please see details at the bottom of this post on how to enter. But before we get to that, don’t ‘cha want to see my crazy “behind the scenes” rigged setups? I can’t believe I’m doing this, but I want to show you that you don’t have to have elaborate food props or a ton of expensive dinnerware to make your photos look stunning (not that all of mine are). Yikes! 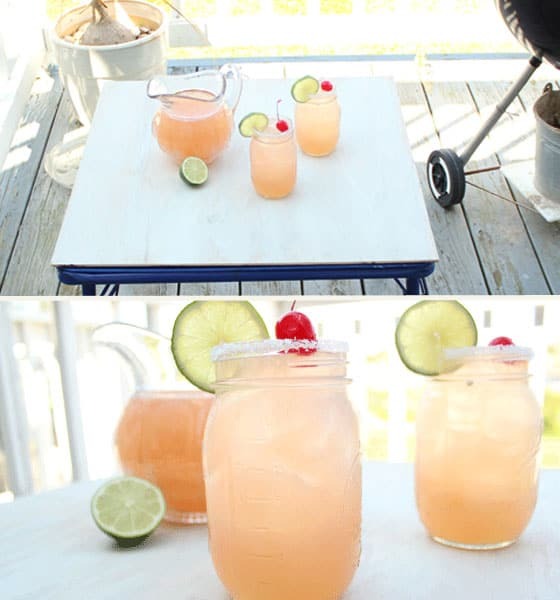 Here are my Cherry Beer Margaritas back in April 2012. Please note that I have since scrubbed that filthy back porch. We had just moved and it was on the “to-do” list at the time :-|. I don’t know how many times this photo has been pinned on Pinterest, but I can tell you it is a LOT. I love my Mason jars and borrowed the pitcher from my Mom. 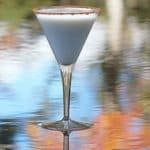 Did I mention it’s a darn good drink, too? I used a little fold-up card table with a 2×2 board that I purchased from my local home improvement store for $4. I currently have 5 boards that I painted and/or stained both sides. 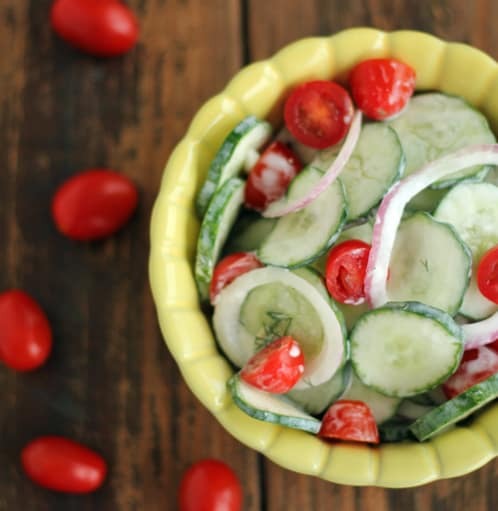 Did you know the background for my Creamy Cucumber Salad is an old side table I purchased at my local flea mall for $3? I was THRILLED! They even loaded it into my car for me! 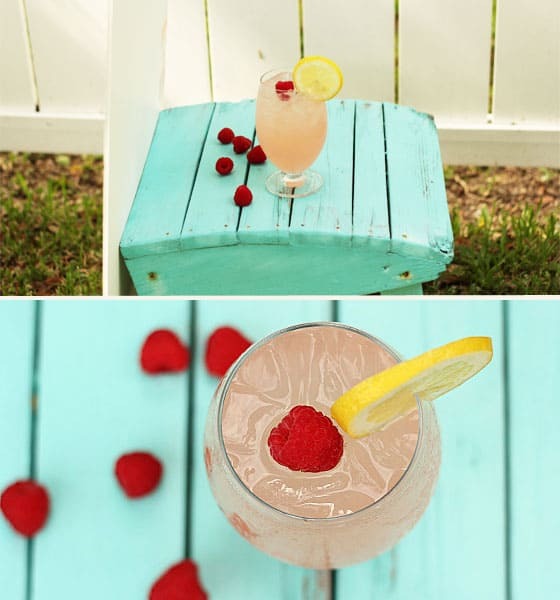 You’re gonna laugh at this one…the background for my Raspberry Lemonade Cocktail is an old weathered foot stool to an Adirondack chair! I placed a brick under one side so that it sat horizontal. 🙂 The white board is just a piece of foam board I purchased at Staples to “bounce” the light so there wouldn’t be a shadow. You’ll learn all of that stuff in this awesome book! 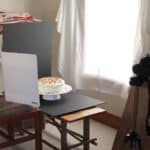 Plate to Pixel by Hélène Dujardin was my saving grace when it came to learning about food photography and styling. I also learn from other blogs, magazines and tutorials. I never thought I’d have so much passion for taking pictures of food, but quickly discovered it was embedded in my soul somewhere just dying to come out! This book is empowering; providing you with information such as the benefits of natural light, food styling, camera settings and ideas for food props and backgrounds. I hope that in some way (even by exposing you to my dirty back porch) I have helped and inspired you. There are ways to work around limited resources…you just have to go out there and FIND them! Oh, and I am leaving all of my “less than stellar” photos on the blog. Because I want to remember my journey. Okay, now for the giveaway info! Please comment below, telling me what you hope to learn from this book. One lucky winner will be chosen via Random.org on Monday, August 6. Entries are open to residents of USA and Canada. Good luck! This contest is now closed—congratulations to lucky commenter #9–Victoria! Love this artical. I am using my phone camera for my food shots and of course struggling with it. My blog is new and my photos show it I’m sure. Thanks for the pointers. Great post! Love seeing the before and after and seeing how your progress has come along. 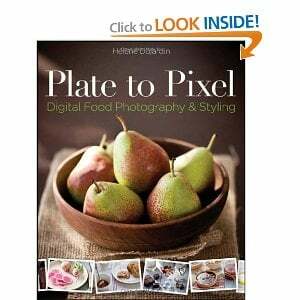 We love “Plate to Pixel” and think Helene is a superb teacher. I like the use of your colorful footstool as a backdrop. You’d be surprised at what can pass for a background and finding different textures to see how they will look on camera is half the fun of doing photography. Keep it up Amy! Thank you Sarah! I have definitely found out that it’s tricky for sure–drinks are hard right now because it’s so hot outside, the ice melts very quickly! Hey Amy! Thanks for sharing. I love photography too! I picked my cherry tomatoes last nite and they were so purdy, I said I gotta take a picture of these and draped them all around the kitchen lol ( yea I’m crazy, but it makes me happy lol). Keep on keeping on! You rock! LOL Thank you Donna! Cherry tomatoes are so pretty—if you think you’re crazy what do you think some of my neighbors think about me when I’m outside? Some of them don’t know what in the world I’m doing…Ha! I have loved photography for years. I have focused on flowers and food for the past 6 months. I have definitely had better luck with the flowers because of the natural lighting, and have just started photographing food outdoors. I would love to win this book, I am sure it would provide some great insight that might be obvious to others! Hi Donna! I’ve been wanting to take more photos of flowers for sure–especially while most of them are in bloom now! I learned just enough photography skills with my new Canon T31 and f1.4/50mm lens from my sister-in-law, who is a photographer to get decent pictures, but I am really hoping to get more creative with my shots and learn more about enhancing my pictures. 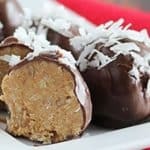 Pictures of food are the first things I notice on blogs and in my magazines and would really like to make my food look as good as I hope it will taste for everyone. I generally am taking pics of what we are eating for dinner, so I try to move fast so I can get it on the table. Your blog is great! Keep up the good work! Thank you so much! I have an f/1.8 50mm lens I love it. 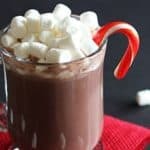 Your photos are awesome and I love your blog! You may call yourself an amateur but that photo of spiked peach tea is totally PROFESSIONAL. I have dabbled in photography for over 50 years and am envious of your natural ability. Please put my name in the hat for the drawing. I hope I’m not too old to learn… You rock, lady! I admit I’m guilty of being one of your pinterest fans, and yes, I did pin your Cherry Beer Margartas 🙂 I love to cook, and I am trying to dabble with photography while baking so that I can create tutorials of recipes to encourage families to gather around the table with meals that cost about $2/serving….perhaps it’s not to late to teach an old dog a new trick or two? This book has been on my list forever! It’s amazing how much of a difference photography skills make! When I first started I used my palm pilot cell phone! YIKES! Oh, and I’m hoping to learn how to perfect my lighting since I live in CT and the day’s sunlight is so short in the fall/winter during dinner time – which are the seasons and time I most love to cook and photograph!